Advance Tabco TTS-5D Stainless Steel Solid Tray Slide with Drop-Down Brackets - 77 3/4" x 10"
Advance Tabco TTS-5 Stainless Steel Solid Flat Tray Slide with Fixed Brackets - 77 3/4" x 10"
Advance Tabco TTR-5D Stainless Steel Tubular Tray Slide with Drop-Down Brackets - 77 3/4" x 10"
Advance Tabco TTR-5 Stainless Steel Tubular Tray Slide with Fixed Brackets - 77 3/4" x 10"
Advance Tabco TCB-5 Cutting Board - 77 3/4" x 8"
Advance Tabco TDS-5 Dish Shelf - 77 3/4" x 7"
Perfect for buffets, catered events, cafeterias, and more, electric steam tables keep your food hot and ready to serve throughout meal service. Steam tables get their name from the steam that's produced as the water in the spillage pan or sealed well is heated from underneath. 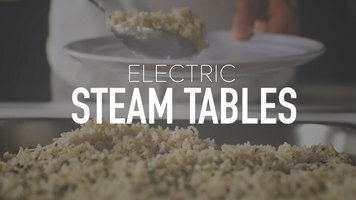 When deciding on the electric steam table that's right for you, it's important to examine all of your options. And remember, steam tables are designed to keep your food warm; they're not a means to cook your food. Sealed well steam tables are best for moist heat holding and they offer the added advantage of easy cleaning. These units don't use spillage pans, so you add water directly to the well from a connected water source. They also have drains that allow you to empty the water effortlessly when you're finished. However, if you have crispy options like fried chicken or French fries, then you'll want the flexibility that an open well unit provides. Open wells have exposed heating elements that require the use of water-filled spillage pans for moist heating, but they also allow you to take advantage of dry heat holding by not using the pans. Additional features to consider are whether you want a stationary or a mobile unit with casters, and what type of controls you want. We offer both infinite and thermostatic options to give you the level of control that's best for you. We also have different base styles to choose from, including enclosed bases, open bases, and undershelf models to suit your needs. 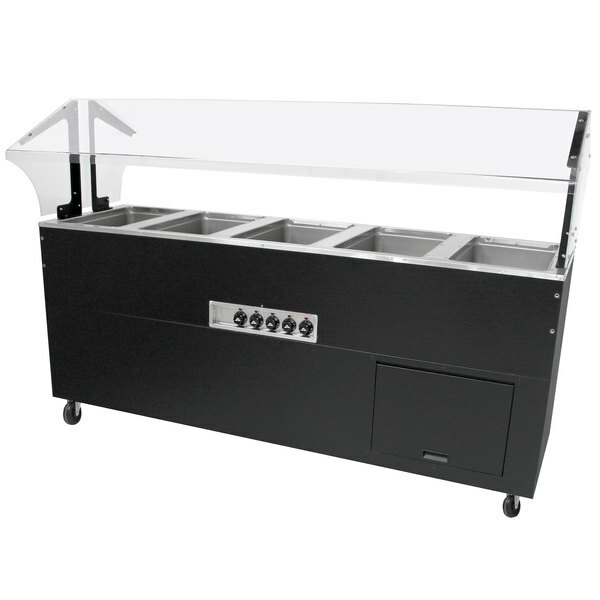 Electric steam tables are a great choice for catered events, cafeterias, and buffets. Watch this video to learn more about how your food service establishment could benefit from an electric steam table today. 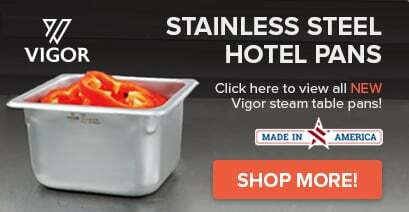 What's the difference between open well and sealed well steam tables? Open well tables can be used with spillage pans for moist heat holding, or without pans for dry heat holding of fried foods or other crispy items. This design allows the flexibility to have some of the wells using moist heat, and some of them using dry heat, at the same time. Open well tables do not have drains, so the spillage pans must be removed and emptied after service. Sealed well tables do not need spillage pans; water is added directly to the well, and is emptied through a drain after service. However, sealed well tables should not be used for dry heat holding. If you’re not sure which style is best for your needs, please contact Customer Solutions prior to placing your order! Keep all your signature menu items piping hot and readily available with the Advance Tabco BSW5-240-B-SB five well Everyday Buffet hot food table. This powerful warming and holding unit can accommodate five 12" x 20'' food pans at once, while a double-sided thermoplastic polymer sneeze guard with side panels serves to protect your food from harmful airborne contaminants. Each well is fitted with fiberglass insulation for added performance and features a sealed well design with an M-shaped element compartment. Plus, the manifold drains allow easy emptying. This unit is designed for years of long-lasting use thanks to all stainless steel construction that includes a 20 gauge, 304 series stainless steel top, a 20 gauge stainless steel body with a matte black vinyl finish, and deep drawn 20 gauge stainless steel wells. Be assured of a professional-looking presentation with the enclosed base of this steam table. Its black matte finish blends in with any decor and the removable panel hides interior components but also allows access for operation and maintenance. For effortless transport, a total of four swivel casters, two with brakes, are included. Other features include built-in indicator lights and infinite control knobs that are recessed to prevent clogging from spilled food. Left to Right: 77 3/4"
This item has been tested and meets safety standards imposed by the Underwriters Laboratories (UL). This unit comes with a locking NEMA L6-30P plug.